Bacanora is a type of Agave spirit grown and produced in the state Sonora, in northwest Mexico. Like Tequila and Mezcal, Bacanora is made from the spiky Agave plant native to Mexico. Mezcal is an umbrella term that describes agave-based spirits that are fire-smoked or roasted before fermentation. An important distinction to note: Tequila is technically only made from the blue agave plant, while Mezcals can be made from dozens of different versions of the plant. 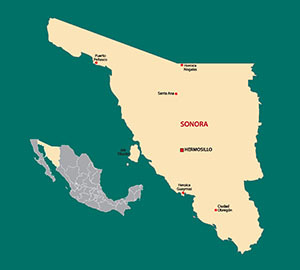 In terms of Terroir, it is the dry and arid climate, hot days and cold nights of Sonora that give Bacanora its alluring flavor: dry, complex, and peppery with an earthy finish. Que combinacion!